This is a really good quick meal as apart from having a few stalks of asparagus in the fridge I would have all these ingredients to hand most of the time. Get the salmon out of the freezer and put it in a large frying pan with a little olive oil or butter on low. Snap the ends off the asparagus and chop into pieces about an inch long. Cut any thick chunks in half lengthwise. When the salmon is nearly cooked add the asparagus to the pan and toss occassionaly. Don't worry if the salmon breaks up - you want it broken up! 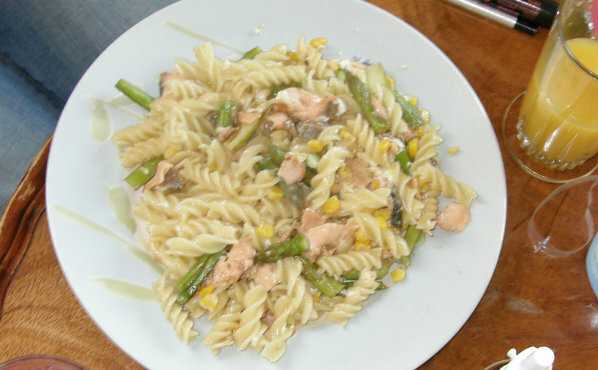 Break up the salmon and add the sweetcorn (and nuts if you've got some, see below). Fry for another minute or so. By now the pasta is probably cooked. Drain it and add it to the frying pan. Try to judge just the amount that will be eaten so you don't waste the salmon and asparagus part on unused pasta. Toss together for a moment then break an egg into the pan, add a little salt and pepper and stir continuously until the egg is cooked. Serve up on a plate and cringe if you teenager adds tomato ketchup!!! I forgot to pop some nuts in today, adding a few pine nuts or cashew nuts always goes down well.